Vera Milne at the Royal British Legion, Fraserburgh Branch. She could either work in the munitions factory, or be based at the canteen inside the Gordon Barracks at Bridge of Don. Mrs Milne chose the latter and went on to serve the soldiers who were based in Aberdeen, although was later posted to Buckie and Perth. Her husband, meanwhile, served in Italy and her uncle had previously been a stretcher-barer during World War I. The 95-year-old now exchanges her wartime stories with fellow veterans at monthly comradeship events in Fraserburgh, organised by Legion Scotland. While the gatherings may not be everybody’s cup of tea, Mrs Milne said they have become a lifeline for her after a fall left her unable to get out and about. She is now recovering and thanks to volunteers like Theresa Wilson, she is picked up in a minibus and taken to the gatherings which she is thoroughly enjoying. 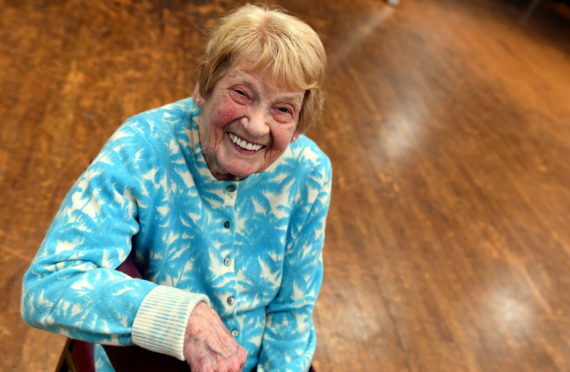 Mrs Milne said: “I had a fall about a year ago and I was lost. I wouldn’t go out or anything. “Then Theresa started coming round and we would go away to Morrisons and other places. Mrs Wilson is one of Legion Scotland’s team of volunteer befrienders, and regularly visits Mrs Milne to keep her company, take her to the shops or even to the hairdressers. The Press and Journal’s Force for Good campaign aims to highlight the work of such volunteers, while raising awareness of some of the struggles faced by services personnel. We have teamed up with Legion Scotland, SSAFA and Help for Heroes to share some of their stories – and potentially encourage readers to get involved or donate towards their work. Mrs Wilson said: “I’m just very interested in people and I know elderly people can be quite lonely. “The veterans did a lot for us and it is because of them we are today. I just wanted to do my little bit. “I find their lives very interesting and they have given a lot of service for us. Emily Clark is Legion Scotland’s veterans community support co-ordinator for Aberdeen, Banffshire and Kincardine. She said events such as the comradeship lunches help tackle isolation, and ensure veterans of all ages can engage with others who can understand their past lives. Miss Clark said: “We don’t want them to be sitting and staring at the same four walls and these events give them meaningful engagement. “They say to me they can speak with other veterans at these events and there is no need to explain anything as they connect with other people with a military background.